Topics: Oracle VM 3.2, Oracle Enterprise Manager 12c for Infrastructure Cloud management. Topics: Oracle VM 3.2 virtual infrastructure configuration and management best pratices. Topics: Dell Compellent All Frash Array for Oracle OLTP database, Dell PCIe SSDs for Oracle OLTP database. 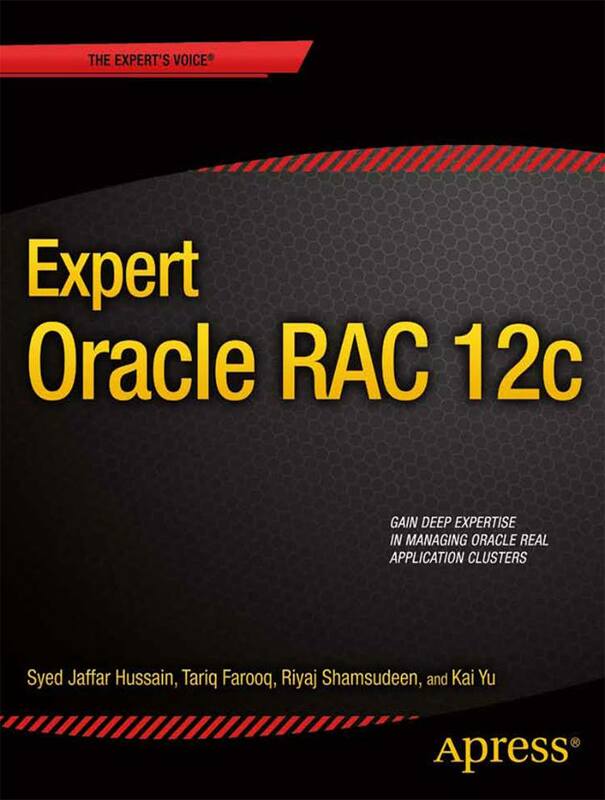 Expert Oracle RAC 12c is a hands-on book helping you understand and implement Oracle Real Application Clusters (RAC), and to reduce the total-cost-of-ownership (TCO) of a RAC database. As a seasoned professional, you are probably aware of the importance of understanding the technical details behind the RAC stack. This book provides deep understanding of RAC concepts and implementation details that you can apply toward your day-to-day operational practices. You’ll be guided in troubleshooting and avoiding trouble in your installation. Successful RAC operation hinges upon a fast-performing network interconnect, and this book dedicates a chapter solely to that very important and easily overlooked topic. All four authors are experienced RAC engineers with a wealth of hard-won experience encountering and surmounting the challenges of running a RAC environment that delivers on its promise. In Expert Oracle RAC 12c they provide you a framework in which to avoid repeating their hard-won lessons. Their goal is for you to manage your own RAC environment with ease and expertise. Tariq Farooq is an Oracle Technologist/Architect/Problem-Solver and has been working with various Oracle Technologies for 20+ years in very complex environments at some of the world’s largest organizations. He is the founding President of the IOUG Virtualization & Cloud Computing Special Interest Group. He is an active Community Leader/Organizer, Speaker, Author, Forum contributor, and Blogger. He is the founder of www.brainSurface.com, a Social Networking & IT Collaboration site for the various Oracle Communities with thousands of signed-up users. Tariq founded, organized and chaired various conferences including, amongst others, VirtaThon, the largest online-only conference for the various Oracle domains; the CloudaThon & RACaThon series of conferences; and the first ever Oracle-centric conference at the Massachusetts Institute of Technology (MIT) in 2011. He was the founder and Achor/Show-Host of the VirtaThon Internet Radio series program. He was also the Track Manager for the Virtualization and Cloud Computing Tracks for COLLABORATE 2012 & 2013. Tariq is an Oracle RAC Certified Expert, holds a total of 14 professional Oracle Certifications and, is the author of 100+ articles, whitepapers & other publications. Tariq has presented and spoken at almost every major Oracle Conference/Event all over the world, including Oracle OpenWorld, COLLABORATE, BrainSurface, VirtaThon, IOUG, OOUG, OUGLC, TCOUG, UKOUG, The OTNExpert+ Conference & others. Tariq has been awarded the Oracle ACE and ACE Director awards from 2010 – 2013. Riyaj Shamsudeen is an industry-recognized RAC expert and performance tuning specialist with 19+ years of experience in implementing, using, and tuning RAC and Oracle products. He is an Oracle ACE Director and proud member of the OakTable network. Riyaj has co-authored many books about Oracle Database. He is an active blogger (at http://orainternals.wordpress.com) and frequent international speaker in major conferences such as UKOUG, HOTSOS, Open World, and RMOUG. Kai Yu is a Senior Principal Engineer and technologist in Dell’s Oracle Solutions Engineering Lab specializing in Oracle RAC, Oracle Virtualization, and Cloud. With 18+ years of experience working on Oracle technology, he has implemented and managed many large, mission-critical Oracle RAC databases, including those in his tenure with an IT organization having more than two thousand RAC databases. Kai is a well-known author of technical articles and a frequent speaker at Oracle conferences such as OpenWorld, Collaborate, UKOUG, Finland OUG, Norway OUG, OTN Asia/Pacific tour, and Latin Americas tour. He has also keynoted at Oracle Architect Day. Kai has served IOUG’s Oracle RAC SIG as president, and in two chair positions. He has served the IOUG Collaborate conference committee, as well as managing IOUG’s RAC boot camp, HA boot camp, and Enterprise Manager 12c deep dive. He was awarded the Oracle ACE Director title in 2010, given the Oracle ACE Spotlight in 2011 by Oracle Technology Network (OTN), and named the 2011 OAUG Innovator of Year Award by the Oracle Applications User Group (OAUG). In 2012, Oracle Magazine awarded him the Oracle Excellence Award: Technologist of the Year: Cloud Architect. Kai has been active in sharing his Oracle knowledge on his Oracle blog at https://kyuoracleblog.wordpress.com/.